Thank you to all who supported the 2018 Winnipeg Jets Gala Dinner! Nearly $360,000 was raised for the more than 35,000 youth (and growing) who benefit from True North Youth Foundation programming each year. “The True North Youth Foundation makes a real difference in people’s lives and it makes for a better community.” said Blake Wheeler, the captain of the Winnipeg Jets. More than 850 guests came together at Bell MTS Place on Nov. 7 to socialize, dine, celebrate youth, and to mingle with the Manitoba Moose and Winnipeg Jets hockey teams. Ace Burpee was the host for the night’s festivities and the work of the Winnipeg Jets Hockey Academy, Project 11, and Camp Manitou was highlighted throughout the evening as JetsTV Host & Insider Jamie Thomas interviewed players and foundation staff. Executive Chairman of True North Sports + Entertainment, Mark Chipman, made a heartfelt speech and introduced a special video highlighting the growth of Camp Manitou. He explained the Foundation’s substantial investment in Camp Manitou over the past four years to boost the adventure activities offered, build new amenities and repair aging infrastructure. Mark also introduced the exciting expansion plan which includes a new 10,000-square-foot lodge as well as a 150,000-square-foot man-made lake that will double the number of youth hosted at camp and make their experience more meaningful. During the cocktail hour guests had the opportunity to bid on 40 amazing prizes in the auction and lucky winners went home with unique experiences like a California trip to watch the Jets play on the road featuring a visit with Teemu Selanne, a fishing adventure with Connor Hellebuyck and Laurent Brossoit, a classroom party with Mark Scheifele, a gaming experience with Nikolaj Ehlers and Patrik Laine, a skate party with Blake Wheeler, and a trip to Monte Carlo, Monaco. 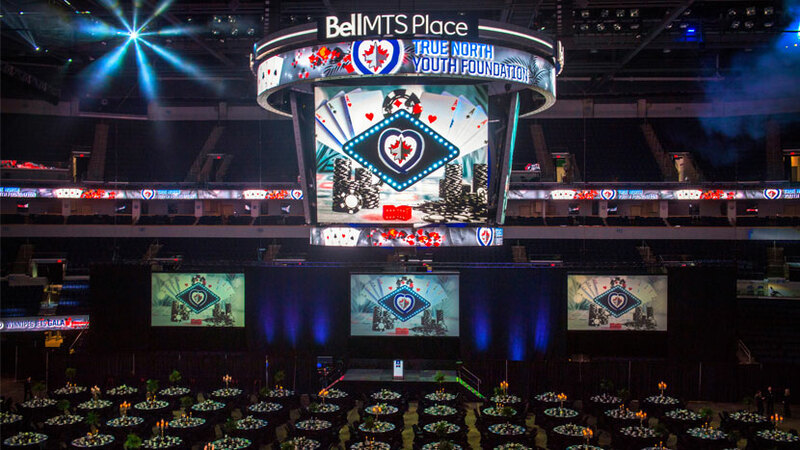 After a wonderful meal, the evening was capped with a fun money casino hosted by the Manitoba Moose and Winnipeg Jets players and coaching staff. The annual gala dinner was a celebration of what happens when great programs, committed community partners and vibrant supporters come together to create opportunity in our community. The success of the evening showcases the generous and caring spirit of Manitobans. Thank you to all who joined us to make a memorable and meaningful evening and for playing an integral role in the True North Youth Foundation family!